Johnson's Japan, Nippon, Kiusiu, Sikok, Yesso and the Japanese Kuriles. 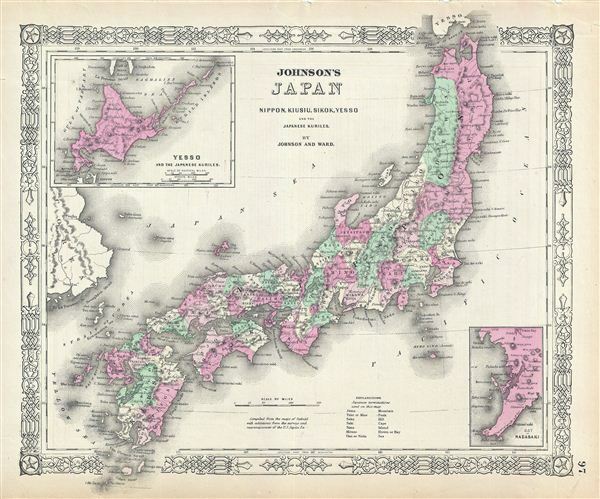 This is Johnson and Ward's 1864 map of Japan. Compiled by A. J. Johnson from the map of Siebold with additions from the surveys and reconnaissance of the U.S. Japan expedition, this map covers the Japanese Islands from Kiusiu north to Yesso (Hokkaido). An inset map in the upper right focuses on Hokkaido or Yesso and the Japanese Kuriles. Another inset in the lower right quadrant details the Bay of Nagasaki. Japan at this time was passing through the declining years of the Tokugawa Shogunate. Japan's centuries of relative isolation ended with Commodore Perry's historic opening of Japan in 1854. Japan's first embassy to the United Stated followed in 1860, culminating in the ratification of the Treaty of Amity and Commerce, which would herald a rise in western, particularly American, influence on Japanese culture and politics. Very good. Text on verso. Minor overall toning. Verso repair near margins. Rumsey 0352.071. Philips (atlases) 843.